Standard DBT includes four stages and a pre-treatment phase. There is no timeline for moving through these stages. 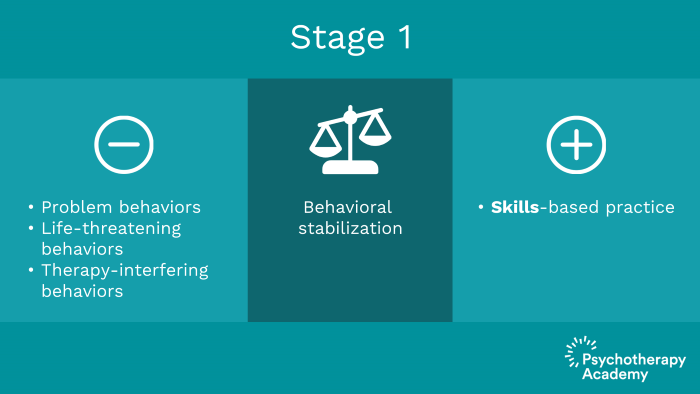 Most patients begin in stage 1, which involves behavioral stabilization. Childhood history and histories of trauma are not addressed until stage 2. Very little information exists for treatment in stages 3 and 4. There are four stages and targets in DBT treatment. 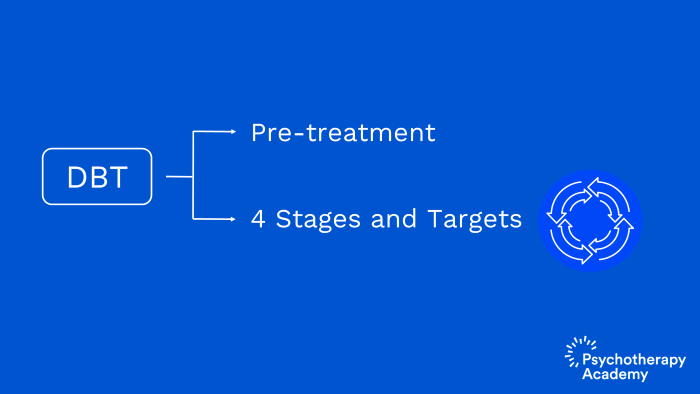 The four stages and targets do not include the pre-treatment phase which is the phase that every potential DBT client needs to participate in. Once passing through the pre-treatment phase when the therapist and client determine that they can work together, they typically enter stage 1. 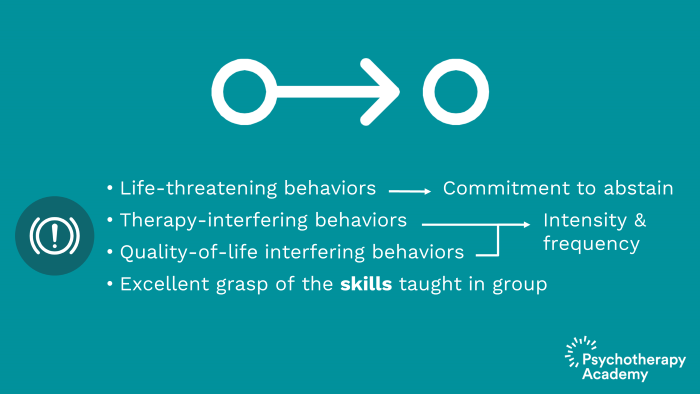 Stage 1 is when the therapist and the client work together to get behavior under control reducing problem behaviors, life-threatening behaviors, therapy-interfering behaviors and increasing skills-based practice. The patient will be learning skills in stage 1. 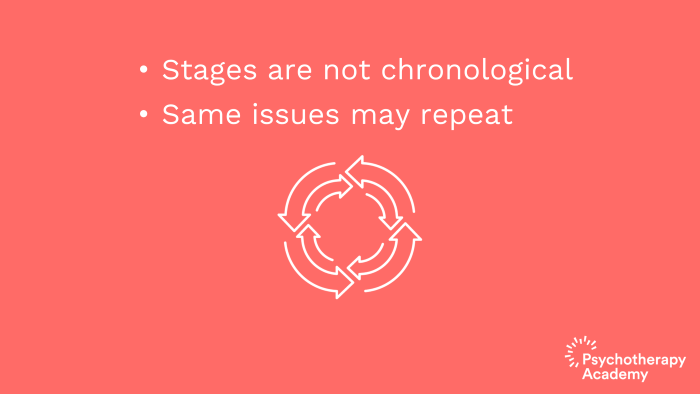 It’s important to understand that the stages are not chronological. They’re actually circular, meaning that there are certain issues in each stage that the therapist and the client may have to work through repeatedly. So it is not uncommon for a pat ient to finish stage 1, enter stage 2 and then go back to stage 1 again. Stage 2 involves reducing any trauma-related symptoms including formal diagnoses of posttraumatic stress disorder and other traumatic emotional experiences that may not fit the criteria for PTSD. In addition, invalidating emotional experiences that clients may have experienced when they were in childhood can be discussed here as well. It is important to not turn up the heat in therapy as much until you are in stage 2. 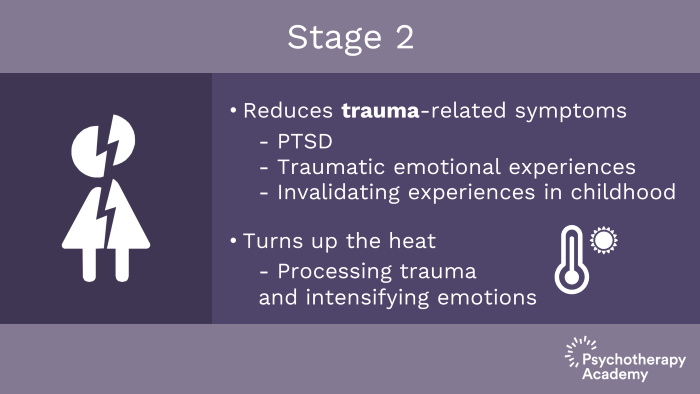 I think of stage 2 as turning up the heat because we’re processing traumatic histories and intensifying emotion. It is essential not to intensify the patient’s already difficult emotional experiences from stage 1. So how you determine the stage that a client is in DBT depends upon the behaviors that they exhibit when they come to treatment. Most often, patients will come to therapy with a tendency to begin in stage 1. They may have self-harm that’s present. They may have suicidal behavior or ideation that’s significant. They may also have what DBT refers to as quality of life interfering behaviors, significant quality of life interfering behaviors such as substance abuse or very dysregulated romantic relationships, anything that contributes to the difficulties in creating their life worth living. So if they are exhibiting any of these problem behaviors, then they would begin in stage 1. It’s not really possible to have a patient fully resolve all stage 1 behaviors prior to moving on to stage 2. However, the most important thing to get under control is the suicidal behaviors and self-harm behaviors. The amount of time that DBT therapists will recommend for having a patient abstain from life-threatening behavior before moving in to stage 2 is variable. Patients must have a commitment to abstain from life-threatening behavior prior to moving on to stage 2. And when considering therapy-interfering behavior or quality of life interfering behavior, the therapist will want to consider the intensity and frequency of both of those. By the time a client moves in to stage 2, they should have an excellent grasp of the skills which are taught in group skills training. For each stage, there are targets which are prioritized depending upon the relevance to the patient’s daily behavior and the relevance to the session at hand. So this is a target-based agenda in individual therapy. The targets differ for individual and for group as well as for intersession contact such as text messaging the patient, emailing the patient or calling the patient. There are different targets for each of these which we can go over in a later section. Beyond stage 2, the stages 3 and 4 are not as developed as stages 1 and 2 in DBT theory. In fact, not much has been written about stage 3 which involves living life, trusting the self and reaching individual goals or stage 4 where the patient obtains deeper meaning through spiritual existence. Most of the work that is done in DBT that has been studied is on stages 1 and 2. Key points. Standard DBT includes four stages and a pre-treatment phase. All patients begin in pre-treatment. There is no timeline for moving through these stages. The targets differ in each stage. Most patients begin in stage 1. Stage 1 is the most frequently discussed and involves behavioral stabilization. 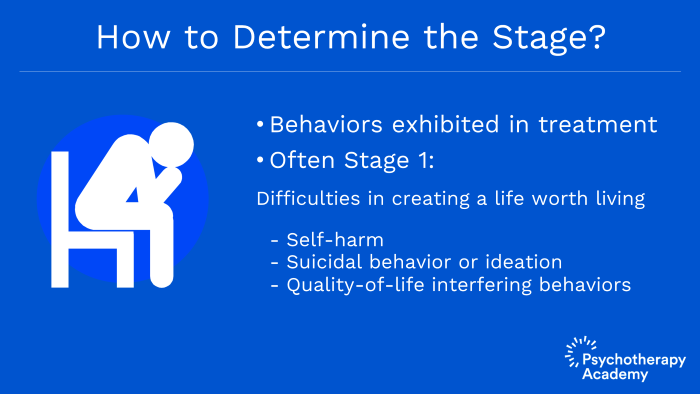 If with life-threatening behaviors, self-harm or significant therapy-interfering behavior or quality of life interfering behavior, the patient should remain in stage 1. Childhood history and histories of trauma are not addressed until stage 2. And finally, very little information exists for treatment in stages 3 and 4.